The need to transform myself is so strong that it’s like a undertow pulling me in to a new rhythm, drowning me. This happens all the more when I struggle against the current, resisting with feeble humanness, paddling through fifteen-foot waves with only smooth palms as instruments of survival. Each time a wave bats my shoulders and eddies around my feet, filling my mouth water, my lungs burning with salted spray, I continue to fight, heaving up and missing, no place to kick off. What am I fighting against? Why is the other direction so scary? Why is the same vast body less comforting when I’m dragged and pummeled by it then when I release the tension and float with it toward some distant shore? Or should I turn toward it, as they say, to swim with the current? I must be willing to aim the trusted vessel of my body into the unknown because I’m already well equipped to mutate, born under the constellation of the Archer, having entered the world in a dire battle for life—or so my mother tells me. Here is the reason for the raging battle: I no longer want mere survival. I’m not looking for an oar or a raft or a boat. I’m searching out dry land, a rock for these high-water, riptide times. This is not a poem or a metaphor. It’s a thirst for fresh water and a firm foothold amongst the living. Will I live? This time, I’m paddling with the swift motion of the force swelling around me. The surging water is sweeping me away from familiar ground, the old things broken up by a sudden storm. The realization of my own mortality, of the constant corporal dying that must not be met with spiritual or emotional death. This dying is a call to life, shaking me awake to my floundering in the surf, afraid to let loose in the deep or set out for the dry place beyond. This thing in me is asking me to grow, to let go of the small hallowed out place in which I hide, whence I retreat, removed from light. Who cares? Only I do. Only I. Walking away, saying ‘no’ to things we’re in the habit of yessing, is never easy. Reality can quickly become insanity like a thousand fragments of truth, none remotely recognizable, yet quite definitely a part of the whole. Who we are eludes defining, evades labels. Searching for the lost parts of myself after deaths, breakups and separations becomes a project of enormous proportion. Shaking my scattered parts, sifting through my past, scanning the oddities, looking for a piece of me I can place in time and connect with: here the edge of a wave, there a shoreline cut at just the right cresting angle to fit my own, I’m inclined to take my time with this one. This week marks my fourth week battling Shingles. It is now officially a saga. What can I do now that the pain has moved beyond what Motrin can control? I am beside myself with pain—literally; I’m like an alien unto myself, watching myself wriggling beneath a glass. I don’t recognize this body anymore. This new level of pain, discomfort and sensation is almost more traumatic than Shingles itself. After two weeks, I felt that I had sufficiently recovered to claim that I had overcome my ordeal, surviving all the worse that Shingles has to offer. That is when my second outbreak began. All of the healed areas were once again under siege. A new level of sensation has taken hold; torture owns my body. Itching, biting, and walking creatures move along the flesh of my chest and march beneath my arm at will. This can’t be real, I tell myself, but it is. My face muscles convulse; my eyelids—the tops and bottoms on both sides—twitch and pulse. My fingers go numb, and a star of pain ignites in the center of my back, exploding into emptiness. I cancel plans. Buckle down for another term. My sadness, resignation and grief at my emotional and physical distress are overwhelming. When this all started, with my usual optimism, I decided that everything would work out fine because it was the beginning of my spring break, and at least, I could stay home and convalesce, and perhaps with some luck, party the last weekend before school. This is the story I told myself. This is the presence of mind I embraced. What a ridiculous fantasy. I urged my partner to go on vacation without me because there was no way I could do anything, go anywhere or see anyone. I have had to remain inside and sit with my pain. I maxed out on Motrin, going to the edge of the daily dose, reeling with pain at the end of the it; watching the seconds tick by waiting for the next capsule. I even tried to dull the pain with alcohol, but the beast will not be lulled by bottled trifles. I must ride this wave. I have no choice. I have to go on. This is the new trauma of this illness. The pain overwhelms me and my body coils in on itself like an angry snake. As I catch my breath, my eyes drown in tears. I can’t believe that I’m here—still—again! I’m not sleeping, because the pain is more intense at night. My teeth feel like they will crack from clenching of my jaw against the pain, and my head throbs with the pressure. I don’t understand what’s happening, but my body temperature drops, giving me chills and covering my body in thick sweat; the pain rises in waves all through the night. I wake depressed, but I put on a brave face. After all, I am a warrior. I am a survivor. I can handle this. I am flooded with heaviness and the weighty tenderness of a body deprived of rest and fed on a sleepless night of torment. I begin to sob in agony. I am home alone; I can weep with abandon and no one will hear me. This is the problem. I am so alone with my pain. Depression has moved in and is finding the ground fertile. I miss my friends. I miss hugging people. I miss running around with the beautiful children in my life. I miss the amorous touch of my lover. I am an alien in this body. I reach out to friends—over the phone. Please make me laugh or forget. It is little consolation. I yearn to be well again, whole and pain-free. This is trauma, emotional and physical trauma yet it does not compare to other traumas. To me, Shingles is a stern teacher. I must forgive her. Even if I don’t like the lesson, mastery is required. The imposed isolation and the loss of the vibrancy with which I customarily live are more than enough to crush me. I don’t have much to give, because just putting on a shirt feels like an accomplishment. But what I have learned is that people are precious. I don’t think I’ve ever taken this for granted, but now it’s even clearer. I can’t wait to hug people without flinching. Screaming babies will be no obstacle to quality time. I’m looking forward to spending more time with people. I know I’m not the only one affected by this disease. As a community, our lives have been altered. On my way back and down from the crest of the curve, I am aware of how steep and sharp the descent is, no less perilous than any other journey of the human spirit. I hope to understand more about myself as I emerge from this dark night of pain. 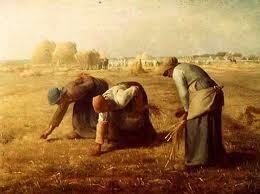 Like one of Millet’s peasants, out of sheer desperation, I am gleaning the earth for sustenance. I plumb my soul in search of the Edissa I’m becoming, holding my hand up to the glass in an awkward greeting. I see me there, and wonder, Who will be left from this fire? Will I know her?